Michelle Kuo’s debut stopped me in my tracks. All other work I had on my plate was shoved to the side while I read this nonfiction detailing Kuo’s after-college years teaching English to at-risk kids in Helena, Arkansas in the Mississippi Delta region. As a piece of literature, this memoir succeeds beautifully; her organization is laced with poetry and the work exudes a kind of transcendental grace. More than once I found myself barking out sobs at the waste of lives we tolerate every day and for her recognition of the means by which we express and acknowledge thanks. Back in 2009 Kuo had published a piece in the NYT Magazine about her two years teaching in Arkansas, and a special student she had there. In one year that student’s reading had progressed two grade levels and his attendance had improved dramatically. His classmates has also named Ms. Kuo a great influence on their lives. The at-risk school closed for lack of funding just as her kids were entering high school. Then Ms. Kuo left to attend law school in Boston. One of the things I liked best about this story is the self-questioning Kuo does regarding her reasons for choosing to teach in the Delta. She explains how racism impacted her and how, learning of writers of the civil rights movement, she felt exhilarated and enabled. She did not think she would do well trying to change the minds of self-interested people in power, but she thought she could bring notions of empowerment to those who had no advocates. Kuo’s parents are my favorite characters in this story. Immigrants from Taiwan, they’d sacrificed everything to give their children more opportunities. When their clever and talented daughter graduated from Harvard and chose to teach in the Mississippi Delta region, they were confused, embarrassed, hurt. She could go anywhere and do anything, and she chooses social and racial justice work in the deep South. She doesn’t claim religious beliefs, and the work wasn’t easy. By the end of her story all of us can see that her generosity of spirit comes directly from her parents, though they didn’t recognize it at first. Kuo names the chapters in her story after works of literature: poems, short stories, novels, or in one case, after the words of an affidavit her prize student, Patrick, signs to acknowledge his role in the death of a man. 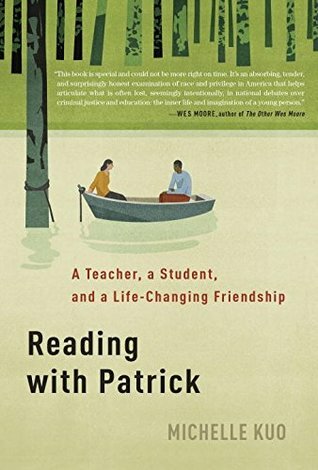 Patrick had dropped out of school when Ms. Kuo left for law school, had allowed his reading and writing skills to languish, and was a vulnerable teen with no oversight in a town that didn’t care very much. Kuo returns to the Delta to teach Patrick in prison, organizing her life so that she can try, in a few short months, to bring back some of the promising boy she’d seen years ago. There were other teachers from northern schools who’d come to the Delta to teach in underserved communities and some had stayed. When Kuo returned to Helena, she was treated to their successes: the segregated black school did better on their state math scores than did the white schools. For the first time white families were complaining their better-resourced schools weren't providing the same kind of opportunity others had; they were moving their kids over. Kuo infuses her work with the language of poets, and insists that we, like Patrick, listen to the sounds and decipher the deeper meanings. She shows us what teaching can be, and what a gift it is when done right. Discipline and good behavior often comes from not wanting to disappoint a mentor, and that impetus is what Kuo provided for Patrick. She draws for us the everyday reality of Patrick’s world so we do not blame him for his own inadequacies. In this way, the memoir is a political book. We are persuaded that certain educational and social polices are not as helpful as others. We can see that there can be benefits to assistance and huge, disgraceful, unacceptable human losses without them. It is unforgivable of us to allow such disparities in opportunity, but we need those whose opportunity is stolen to acknowledge and address that lack. Ms. Kuo teaches us about that nexus, and we are grateful.